"yes ...Yes ..I understand....a tie you say....Well I'll get to that. Just send me the photo finish picture. In the meantime have those fools turn in the hair and the instructions to the DFI lab. Then I need you and those two nut cases in the volcano asap. keep them seperate even if it means pulling some ears. The race results are on the backburner......yes I know they won't be happy....just promise this there will be a winner. I think Diablo may have discovered the reason for the flare....we will know soon as we are going in now." Diablo flies ahead and doubles back and flies ahead again, checking to make sure the following detectives know which way to go. He leads them into the lava monster's cave, and then flutters down near the edge of the lava pool. *OOC: Please don't shut it down! This is fun! *As Scar and the small group go down the stairs to the back entrance to the attraction, Diablo fills the leader in on the situation below. Entering where the passengers usually exit, Scar jumps into one of the ride vehicles. It will take them to the scene. 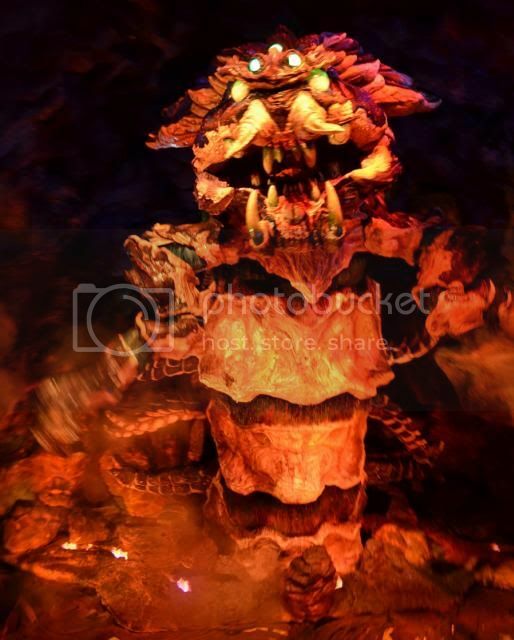 "Ok there is not much left of the tiger as the lava has pretty much destroyed his remains, but put what thee is in a body bag for identification purposes. Not many of us here, but spread out and look for clues." King Candy's car came to a screeching halt. He sat there, glaring at seemingly nothing, his grip still firmly on the wheel. He knew it had been too close... they'd need a photo to determine who won the race. Sitting there, seething, his code wasn't letting up with the glitching just yet... it kept fuzzing in to view every so often. He wasn't paying attention on keeping it under control either, his thoughts were currently all about whether he had won or not. Even the fact that Doof had almost won was infuriating him. Glancing over he noticed Cheshire coming over to them after talking to Scar on the phone; he did mention that they had found something... but King Candy was more concerned with the news they wouldn't find out who the winner was yet.. and that for now it was being declared a tie! King Candy sat in his car for a moment with a look of shock on his face... he tried to figure out what had just happened... had he... tied? How could... he... tie with that scientist!? His expression changed to that of utter rage. "This is impossible!" He shouted, gripping the steering wheel very tightly. His anger and jealously increased so much he wasn't paying attention to what his code was doing at all... which started to glitch violently. Standing on top of the car's hood he pointed at Doof and started yelling at him... it was hard to make out with all the glitching; but something to do with him not even being a proper racer and that he had cheated to get to the finish line. King Candy had quite forgotten at this moment about the poor cricket still atop his crown... which kept disappearing and reappearing due to his glitching. "I am the greatest! Aha! You're going to be sorry!" He threatened him, his code kept switching back and forth from King Candy to Turbo. "I'm going to kill you! Yes, then... then I'll be the winner!" As he said this, his King Candy coding gave way and switched to being dormant; and Turbo was now standing in the place of the King. He now looked completely different; his face was gaunt, his skin tone was grey, his eyes a vivid yellow (so were his teeth) and sunken in with dark rims and he was wearing a classic white and red racing outfit and a helmet with T motif. King Candy now looked nothing like King Candy... except he was still a short man and his voice was the same, lisp and all. In fact King Candy's voice was actually Turbo's voice... though perhaps Turbo's voice was slightly gruffer. Turbo grinned manically for a moment, contemplating how he would dispose of this nuisance. But then finally realized what had happened and stopped, he looked down at himself and then back at Doof. Letting out a nervous giggle he tried to calm himself down... but from what he could tell he could not get the King Candy code switched back on right now. Glancing at Cheshire again... (Who was still grinning! Arrgh! Is that all he did!?) he frowned. "Ah... ahaha... hmmm, it seems.. I... actually should be getting the hair... YES THAT'S IT! The hair to the lab..." Turbo grabbed the bag which it was in from his car; in reality he was still raging about not knowing the results, but the fact he was now in Turbo form was preoccupying the retro video game character's thoughts... what if they didn't treat him like a King now!? HE WAS STILL A KING! Turbo handed in the bag and then went back to his car to drive to the Volcano... wondering exactly what everyone's reaction would be... he glanced up at Cheshire in the tree for a moment and scowled. Cri-kee keeps holding on to King Candy's crown. He notices a flare from the volcano. He wants to check on it, but he decides to keep holding on. He sees the finish line coming close. Cri-kee sees that Dr. Doofenschmirtz and King Candy were neck and neck. Cri-kee hops off of the crown and pushes his way towards the front of King Candy's car. As the race comes to a finish, Cri-kee extends his body from antenna to leg, in front of the car. He makes sure that his antennas are in front of King Candy's car. The race ends, as the cars come to a stop, he flies off of the car and lands in Cheshire's fur. Cri-kee shakes himself to gain consciousness and lays on Cheshire until Dr. Doofenschmirtz and King Candy returns. OOC: Please continue this. I apologize for not being active the past few days... I am dealing with a sudden passing right now. OOC: Oh no! I'm sorry to hear that. Much pixie dust for you and your family! Vanellope glances up to see Diablo retuning to them. From the look on his face, what he found wasn't very good. He begins to lead the detectives in the direction the flare came from. Vanellope notices Ursula tapping Scar on the shoulder, then gesture to someone in the crowd. It was the other guest in the picture! Scar tells Ursula to go and contact him, while the others head to the volcano. Vanellope wonders what he'll think when he hears about the death of the girl. She looks a way from him and continues to follow the others. Vanellope grimaces as they come to the scene with the tiger, who remains were pretty well gone because of the lava. She didn't look at it for too long. At Scar's orders, she began to look around for anything suspicious. While doing so, she thinks back to the conversation Scar had with Cheshire over the phone. Apparently, the race had ended in what appeared to be a tie, and the winner wouldn't be determined until a little later. I bet King Candy's not taking that news too well! she thinks, smiling. Vanellope wishes she was there to see his reaction. OOC: Please don't cancel this. It's been so much fun . @AgentR I'm very sorry to hear about that . Turbo drove off toward the Volcano, he had no idea Cri-kee had been sitting on Cheshire; and in fact hadn't noticed Cri-kee's attempt to help him win either, as he had been in such a rage. When he remembered the cricket he panicked for a moment; trying to find him in his car... but couldn't find him anywhere. For once Turbo was concerned for another and was quite affected by the fact he could not find his new found friend. Had he been flung off during the race? "Where are you? Aha! Oh no, you have to be here... somewhere..." Turbo mumbled, still trying to find him as he approached the Volcano... but to no avail. The old racer sighed, hoping Cri-kee was okay. 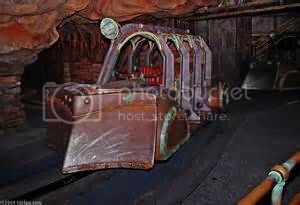 He drove back into the ride and to where the others were, parking his car just off of the chamber out of the way. Turbo glanced around the corner and saw a few of them gathered, including Scar. He guessed the lion would not recognize him and so would have to explain. But he was pretty angry at him right now due to him regarding the race as not very important! Turbo walked over to Scar; but not before glancing at Vanellope with a glare... probably the only one here who knew about him being Turbo... he had no idea what the others thought. "Well! I'm here, but not very happy with how you are handling the results!" He said to Scar, still talking with an authoritative and Kingly tone. "In fact! Aha! I was so unhappy, my code has flipped out! Eheh! And now... well now... I'm Turbo! 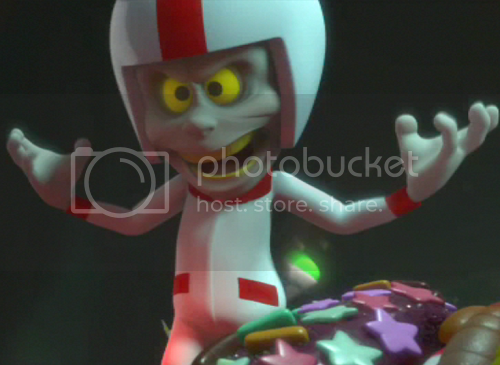 Well, I always have been Turbo, I mean, now my code is switched and..." He started babbling on for a while... some of in unintelligible between the random giggles.... but it ended with; "...and I'm still the King of Sugar Rush!" With that he just stared at Scar intensely and said; "What's going on here then...?" *Scar looks at the others who have gathered. * " It's about time that some of you have arrived." " Just so you know my little friend of diminutive stature. We are looking for clues to solve this case and you are standing in my personal space." " Oh and since you are so worried about your silly little race, you should know I have determined a winner. In the photo it was quite clear actually. However you shall have to wait until dinner where I will announce the winner and present the winners trophy....now if you don't mind I have work to do." "Diminutive stature!?" Turbo yelled in anger. "I'll have you know that a lot of old video game characters... aha! were quite short! Have you ever played Mario!? Or Fix-it Felix!?" He ask rhetorically, but when Scar mentioned he knew who had won... but Turbo would have to wait... Turbo just glared as the lion walked off, he was about to say something when he realized Scar had mentioned... a trophy. A demented, slightly psychotic grin appeared on his face. "Trophy...? Aha... turbo-tastic..."
However he then remembered he had not been keeping up with the case! Turbo quickly took out his notebook... but he still wasn't sure what exactly was going on here... he'd have to ask... now that would be embarrassing indeed. Vanellope smirked when she saw King Candy make his way over to them. Or, should she say... Turbo. "Looks like somebody had a tantrum," she taunts, hoping that would irritate him. She laughed when she heard Scar say he was going to make them wait for the announcement until dinner. The look on his face was too much! She still hoped that Dr. Doof had won. She'd love to see the face on Turbo if that happened. After she calmed down a little, Vanellope continues to look for anything suspicious. She ends up coming up empty handed, however. Turbo gritted his teeth when he heard Vanellope's comment... wasn't there something he was supposed to do? Oh yes! Yell at her for throwing the candy! "Don't you have something better to do than CONSTANTLY ANNOY YOUR KIIIIIIIIIIIIING!?" Turbo raged again and pointed at her. "And don't you dare, ahaha! throw candy at ME!" He then seemed to calm down and composed himself, before saying in a quiet but menacing way; "If you continue to annoy me; then I will dispose of you... quite easily," With that he went over to talk to Cheshire who had appeared... and was grinning as usual. "Urgh! Do you have any other expressions...?" Turbo mumbled; though he himself grinned an awful lot in TurboTime. "I need an update on what's going on! Aha!" He added... before noticing Cri-kee sitting on Cheshire! "Ah! You're okay! Eheh! I'm so glad, I was worried... I was, yes," He picked up the cricket; kind of forgetting Cri-kee had no idea why he looked like so different now. "We'll find out who won soon! I'm sure its me, I am the greatest after all!" Turbo's expression was demented again. "I WIN>>>>I WIN!!!!" but then the funny feline informs him that it is a photo finish and they will know the winner later. He is told to report to the volcano after making his delivery. He quickly makes his way to the center of the volcano, but he sees no one around. "Now where did everyone go?" Si and Am are determined to revenge the tiger by helping to find the killer. The start looking around, using their feline intuition they start at the path of the track. Si heads to the left, while Am takes to the right. Out of the corner of Si’s eye, she sees something reflects the light, while Am also sees something shinny near a rock. Si is able to use a claw to get the coin up and Am follows suit. Resisting the urge to play pounce and chase, they carefully examine the coins. They can’t tell what sort of metal they are made up, but there are engravings on it. Looking carefully, the engravings appear to be a cup of some sort. "Everyone gather round. This is actually what the coins look like when they are cleaned a bit." 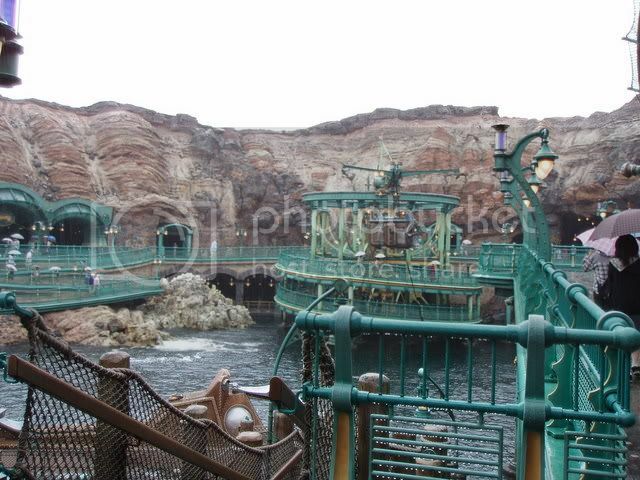 "I also noticed that they are marked for use within Tokyo Disney SEA. I don't know what for, but I will ask Yamadera san." OOC* This leads us to our trivia question. The above coins are actually in circulation and use at Tokyo Disney SEA. My question is what are thay used for...Please explain as best you can. Answer in an OOC within the game and everyone gets one shot at it...no editting your answer please. Cri-kee blinks his eyes, and he suddenly appears in a volcano. He sees what appears to be a scary-looking King Candy yelling at Scar and at Vanellope. He climbs out of Cheshire's fur to listen to what is happening. He then is picked up by the scary-looking man who later learns is Turbo, King Candy's other form. Cri-kee is confused and doesn't know if he should be happy to see King Candy is okay or if he should be scared of Turbo. He catches up on all the clues and the events of the day: the race 'results,' the barbecued tiger, the flare, and the coins. He still did not know what happened about the guest. He jots down everything they say and awaits any more information about the investigation. OOC: Thanks everyone. For the clue, is it a coin used for the storage lockers at Tokyo Disney Sea? OOC* Good guess, but that is incorrect. On a side note take care of yourself and family during this time and don't worry about the game. Turbo could tell Cri-kee was not too sure on him; his yellow eyes gleamed as he remembered the cricket hadn't known about him being Turbo.... he wasn't sure if he should explain or not; if he told him about TurboTime, RoadBlasters and Sugar Rush then Cri-kee might hate him. It was nice to actually have a friend that wasn't programmed into being his friend again... too long it had been since TurboTime. "Aha! Yes. Well my appearance is a... ummm... a bit different; but I assure you! I am still the same person! King Candy! Slight code malfunction... eheh," Turbo explained to the cricket, just before Scar called everyone over. He glanced at the two coins and frowned; having no idea what they were for at all. Placing Cri-kee on the top of his helmet for a moment he starting writing notes down; determined to catch up on the case. "I have to say I have no idea! Hmph! Which is quite a bother..."
Vanellope glares at Turbo as he yells at her. When he's done, he walks over to Cheshire. "You're not my king," she calls after him. "In fact, last time I checked, I was the rightful ruler of Sugar Rush. In case you forgot." Vanellope added, sarcastically. King Candy didn't say anything back, so Vanellope assumed he must've not heard. Or, maybe he chose to ignore it. Either way, Vanellope decides to make sure she's always with another detective for the rest of the investigation. She could just stop bothering Turbo, but it's too tempting. She hears Scar call to them, and sees him standing by Si and Am, who are holding two coins. 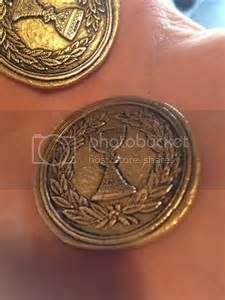 She walks over and takes a good look at the coins, taking out her notepad and writing down the clue in the process. Wonder what they're used for? she thinks. *As Ursula and guest(whom she found out was named Wally) head to the resturaunt Vulcania, she noticed that he seemed tense. If anything, she hoped that the Chinese food would help out with this interrogation, boy was she starving. Requesting that they be seated in a relative seclusion, she wondered how to be sensitive about this. OOC: Sorry for the lack of posts, at work all day yesterday and celebrated my birthday late last night. Are those tokens used in the Fortress explorations for the minature galleons? OOC: I don't even know what attractions they have at TDS! Um... is there a themed restaurant where these are tokens for a free drink or treat?